Located in Playa de las Americas, the Hotel Gran Oasis Resort is specially designed for families and couples looking for a relaxing beach holiday in the Canary Islands. This four-star holiday resort has a choice of all-inclusive plan, bed and breakfast or half board plan, suited to all tastes and budgets. With the beach close by and the popular Siam Park – Europe’s largest water park – only 2km away, Gran Oasis Resort offers several attractions for all age groups. The hotel features modern rooms and suites, a buffet restaurant, poolside bar, snack bars, swimming pools, fitness centre, spa and wellness centre, kids’ activities, sports facilities and more. The hotel also offers one-day tickets for Siam Park to its guests for a day of endless fun. Close by is the Las Americas Golf Course. 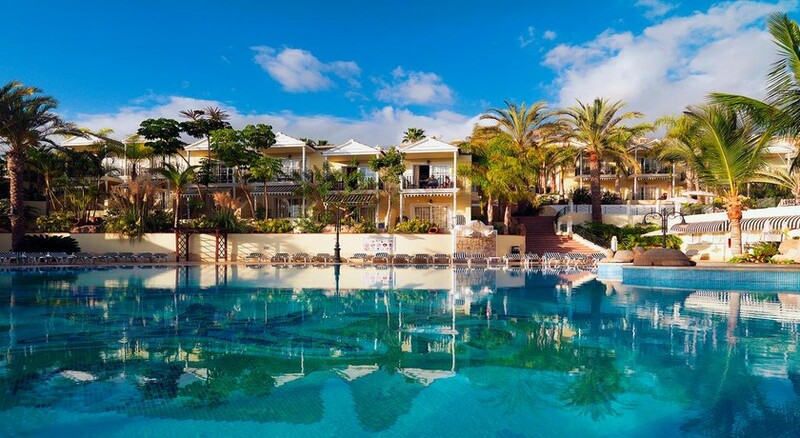 Located in southern Tenerife, Hotel Gran Oasis Resort sits opposite the Las Americas Golf Course, between Playa de Las Americas and Los Cristianos Bay. The Playa de las Vistas Beach is about 2.3km from the resort, where you find plenty of restaurants, clubs and cafés. The hotel is conveniently located close to two amusement parks: Siam Park is around 4km and Aqualand of Costa Adeje is 6km. The distance to Tenerife South Airport is about 16km from the hotel. Guests can visit a number of tourist attractions located in vicinity, such as Las Caletillas Coast, Cabecito and Fañabé beaches, Caleta del Rey, Montaña Colorada and the villages of Adeje and Arona. Guestrooms and suites in Gran Oasis Resort are divided into four categories: one-bedroom deluxe suites, one-bedroom deluxe suites with golf view, two-bedroom apartments and two-bedroom suites with solarium. Amenities include air conditioning, telephone, en-suite bathroom with bathtub, TV with satellite, Wi-Fi, living room, dining room and fully-functional modern kitchen. All rooms can accommodate extra beds, and come with a furnished balcony. The golf view rooms come with a Balinese sunbed, and offer great views of the golf course. The suites with solarium feature a private sun terrace of 70 sq. metres. The Hotel Gran Oasis Resort’s main buffet restaurant offers complete breakfasts and themed dinners, where the spread contains freshly prepared local and international cuisines. The choice of bars includes Taste Bar on the terrace that serves coffee, cocktails, wine and snacks, a pool bar that serves incredible cocktails and mocktails, and the Chiringuito Bar that dishes up lip-smacking snacks throughout the day. All-inclusive guests in the hotel enjoy a day’s free access to the private beach club. 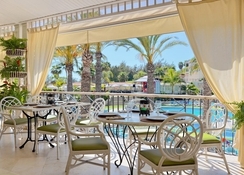 The hotel features three outdoor heated swimming pools – one for kids and two for adults – parasols and loungers are complimentary facilities. The fitness centre of the hotel is fully equipped with gym facilities and a personal trainer throughout the week to assist the guests. If you want to spend a relaxing time, visit the spa and wellness centre, where beauty treatments, massages and therapies are offered. Sports lovers can hit the on-site sports court or tee off at the Las Americas Golf Course located in front of the hotel. Children can join the mini club where a wide range of activities are conducted from morning till evening. Guests are offered one-day free tickets to the nearby Siam Park – Europe’s largest water park. The animation team organises daily kids’ activities, as well as live events and music performances in the evening. 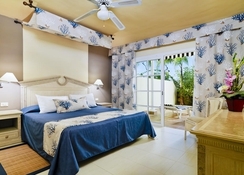 The hotel also provides free shuttle to the beach, Las Americas centre and Siam Park.